Partying is not just a custom, it has become a lifestyle for many. And there’s nothing wrong about it, as a matter of fact, it’s great to chill every now and then. Not unless you’re not doing anything else that actually brings you great value in your life and your future. But this article is not to discourage you from it. So, we’ll leave that trail of thoughts hanging for now. We’re all free individuals after all. In fact, this article actually aims to give you a helpful guide on what to do after a night of an awesome party in your place. 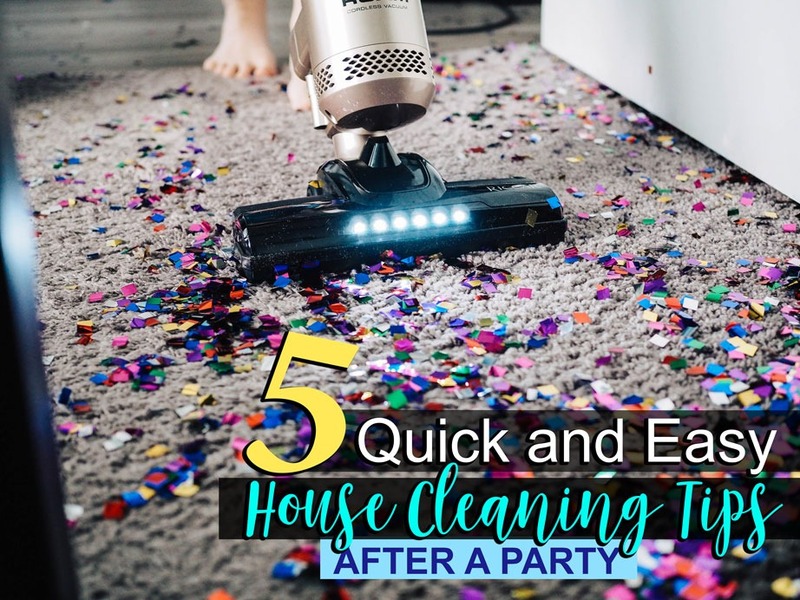 We will discuss different quick and easy house cleaning tips after a huge party. So, after all the booze, the hype and the fun of last night, here you are awakening to chaos. Your mates lying in the floor like casualties in a genocide, wasted and with drools all over their faces. A disgusting scenario isn’t it? Well, that only means that you need to get up now and start dealing with the mess. So that, right after, you can have a peaceful hangover and sober up. For our first quick and easy house cleaning tips, start gathering all the garbage in your home and put them in the trash bags. From plastic cups to packages of chips, collect it. Don’t forget to check the place under your sofa, drawers and other possible places where you can leave trash. Or if there are still leftovers that are edible, put them in the refrigerator or if not, throw them away and put the dishes in the sink for you to wash later. Then, when you finally made sure that you already collected the garbage all over your house, take away the trash bags outside because you no longer need them. The second entry of our quick and easy house cleaning tips is washing the dishes. Make sure to wear gloves when washing them. First, gather all the dirty dishes and wash them with dishwashing liquid. Next, rinse them with clean water and be sure that there are no more dishwashing liquids on it. And finally, wipe them with cloth and arrange them properly in your cabinet. When you have greasy dishes, put them first in a small basin. Pour warm water on it and let it soak there for 2 minutes before washing them with soap. Since you already removed the garbage and washed the dishes, you can now see what are the things that are not in their right places. Again, try to look under the sofa, inside your drawers or cabinets. Check if there are things that are losing and try to find them and put them back on their right location. You will discover how familiar you are with your house without realising it. The next thing we need to do is remove the stains in every part of your house. Check your curtains, sofa, pillowcases and even your wall. Wash all the washable things to remove the dirt. For the stuff that’s hard to move, try wiping the stains off with some detergents. But if you prefer to use a brush, just be careful so your furniture will not get damaged. Aside from that, vacuuming your carpet is necessary. When you find this activity a tough thing to do, just hire experts who can do this hard work for you. But if you insist on doing it yourself, it’s up to you. Start vacuuming those part that needs to remove dust and small debris. Then wash it with a brush, powder and water. When the weather is fine, let it dry under the sun. Quick and easy house cleaning tips can make sure you will get the right clean-up you need. Lastly, mop the floor with clean water, dilute gel and cloth. Pay attention to corners and remove any dirty spots. Not all the floor has the same cleaning care so use the right one that is applicable to your house. And remember to don’t walk on the part that you just mop so you can’t leave traces. When you are done, remove those cleaning tools of yours, open your window and spray some air freshener. These quick and easy house cleaning tips were made to make your clean-up task as smooth as possible. Well, who wants to wake up with a messy place? Obviously, no one will ever like that idea. If you are still living with your parents, then keeping your house neat after a good night is a sign of respect for them. Are you looking for a reliable cleaning company? Maid in Perth is here to do the cleaning for you! Call us today for more details about our services. You can also visit our website for more hacks and helpful articles that you can read. This entry was posted in House Cleaning and tagged After Party Cleaning, Airbnb Cleaning, Apartment Cleaning, Carpet Steam Cleaning, Commercial Cleaning, Deep Cleaning, End of Lease Cleaning, Fridge cleaning, Grout Cleaning, Maid in Perth, Move In Move Out cleaning, oven cleaning, Spring Cleaning, Vacate Cleaning, window cleaning.